The best morning routine sets you up for the day with confidence. Anything else leaves you rolling out of bed hoping for the best. According to research, how we spend the first three hours of the day makes or breaks us. If you’re waking up unmotivated and disgruntled, it sets a precedent for the rest of your day. This post covers 7 mistakes you’re making in your morning routine plus how to fix them. This tool transforms your inbox and makes you 10x more productive. It takes two months (or 66 days) to turn a new behavior into a habit. According to Neuroscientists, the brain starts working less and less as habits form. Habit-making behaviors are traced to the basal ganglia, a part of the brain pivotal with our emotions. Decisions are made in the prefrontal cortex. Once a new behavior becomes a habit (and no longer needs to go through the prefrontal cortex), the decision-making part of our brain goes into sleep mode. In other words, it takes time to get into habits. But don’t get discouraged. What to do: Try creating a habit loop. You’re perfectly capable of turning around your bad habits and becoming the morning person you’ve always wanted to be. Here’s an easy way to set yourself up for success. Before you leave work, make yourself a list of tasks for the next. Enter: The Eisenhower Decision Matrix. 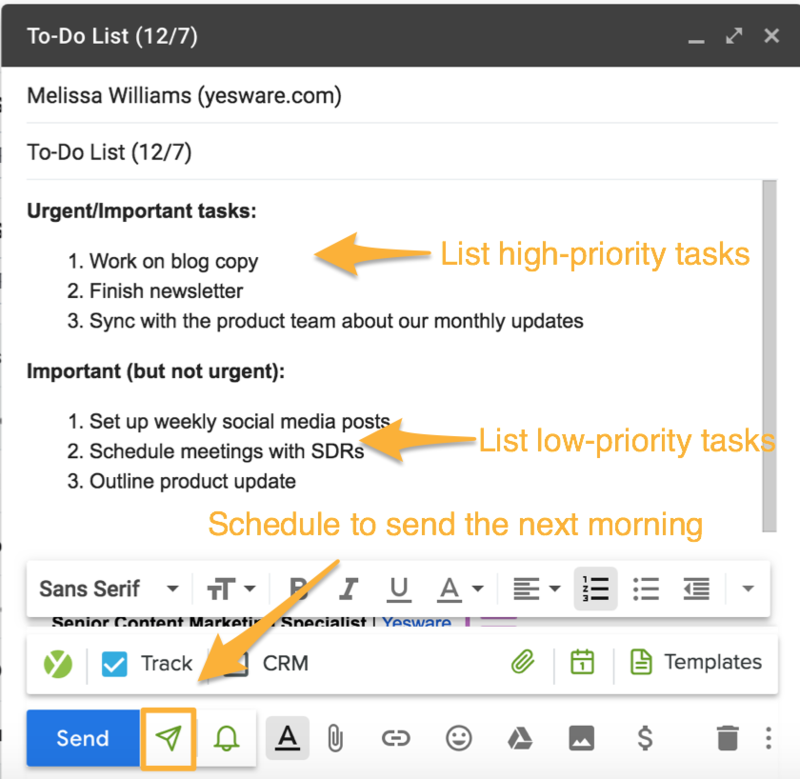 Schedule the email to appear at the top of your inbox when you arrive to work the next day. Lay out your clothes, wallet, bags. Pack additional materials: lunch, gym clothes, anything you need for the office. Plug in your phone and other electronics so you don’t risk having a low battery in the morning. Bonus: Plug Send Later into your inbox for free. Research shows that returning to an interrupted sleep means starting an entirely new sleep cycle over again. When your alarm goes off the second time, it wakes you up in the middle of REM (opposed to at the end), leaving you more tired. The extra sleep does more harm than good. Do you ever step out of the door in the morning and wonder how you got there? You rushed through getting ready and, as a result, it’s all a giant blur. Don’t do that. Instead, take a moment to meditate when you wake up. Chaturanga’s aside, meditation doesn’t have to be difficult. And it has some serious rewards for your brain. A 2014 study showed that meditation rewires your brain the same way lifting weights or exercising rebuilds muscles. So you can stay calm & reach a higher level of awareness. The best part? It only takes a few minutes. If you need extra assistance: Try downloading an app like Headspace that’ll walk you through a guided meditation (for 10 minutes). The average person sleeps 6-8 hours a night. That’s a long time to go without consuming water. Instead of dehydrating yourself further with coffee, have a glass of water. Why you should drink water before coffee: Humans are composed of over 70% water, which means that throughout a day you should drink an ounce of water for each pound you weigh. Turns out, your parents were right when they nagged you to make your bed. Hunch.com surveyed 68,000 people on whether or not they make their beds. The results showed that 71% of bed makers consider themselves happy, while 62% of non-bed-makers were unhappy. By making your bed, you get a small sense of accomplishment first thing in the morning. Be honest: do you share the bed with your phone? It rests next to me, ready to distract me the moment I wake up. The second I open my eyes, it’s there and I feel like I need to catch up. And I’m not alone. 80% of smartphone users check their phones before even brushing their teeth. Using social media can have major consequences on your emotional well-being. A study of more than 1,000 people in Denmark revealed that Facebook browsing can bring down your mood. Users who took a week-long break from it reported much higher levels of satisfaction. What to do instead: Stay away from your phone or computer in the morning. Instead, focus your energy on getting out the door. You’ll have plenty of time for electronics once you get to work. You might feel like you didn’t get enough sleep or that the morning came too fast. It’s easy to forget everything that you do have going for you. We can all name at least one thing we’re grateful for. Did you know that simply thinking of that thing is proven to increase your mental and physical health? In a Harvard case study, psychologists divvied participants into three different groups. After 10 weeks, the results showed that those who wrote about positive things felt better about their life. They also exercised more and had fewer visits to physicians. How to practice gratitude: Keep a list (in a notebook or on the Notes app on your phone) of things you’re grateful for. The next time you’re bummed out, you can reflect on everything going well. There’s no debating the significance of breakfast. Skipping your morning meal is linked to overeating later in the day. Here’s why: eating in the morning stabilizes your blood sugar levels, which won’t happen if you wait to eat. What to do: This one’s simple: Enjoy a nice breakfast. It doesn’t have to be continental. Nutritionist Ruth Frechman recommends a breakfast that contains protein, fruits, whole grains, or vegetables. You could try eggs, oatmeal, whole grain toast, or a fruit cup. Bonus: These tools will keep you organized through the rest of your day. Your morning routine doesn’t have to be a blur. It’s time to stop rushing and overwhelming yourself with tasks you’re unprepared for.